I’ve finally done it! I’ve finally got a decent photo of Tree’s scarf. I realise this makes you think either two things: that the scarf is hideous and that’s why I struggled to take a good photo or that I’m pretty ungifted when it comes to photography. The latter would be correct! The problem with his scarf is that it’s quite a complicated pattern and a bit difficult to get a photo reflecting the true shape and colour of it. The only way I can describe it is as a weaving type of cable with a rib trim (he wasn’t content with a bog-standard cable scarf. Sigh.) It takes a while to get the hang of so it shouldn’t be a surprise that it’s yet to be finished! But I’m relatively new to cabling (incidentally, it’s a technique I only learnt to make Tree his ipod sock!) and knitting is definitely not my forte but I’m sure if you’re an expert you could work it up in no time. A quick note: this is a one-sided pattern, so unfortunately it has got a ‘right’ side and a ‘wrong’ side as most cable patterns to. C6F: Cable 3 forward i.e. slip 3 stitches onto the cable needle at the front of the work. Knit 3 from the main needle then knit the 3 on the cable needle. C6B: Cable 3 back i.e. slip 3 stitches onto the cable needle and put behind the work. Knit 3 from the main needle and then knit the 3 on the cable needle. Then start working criss-cross cable pattern. The following will always be done on the ‘right side’ of the scarf i.e. 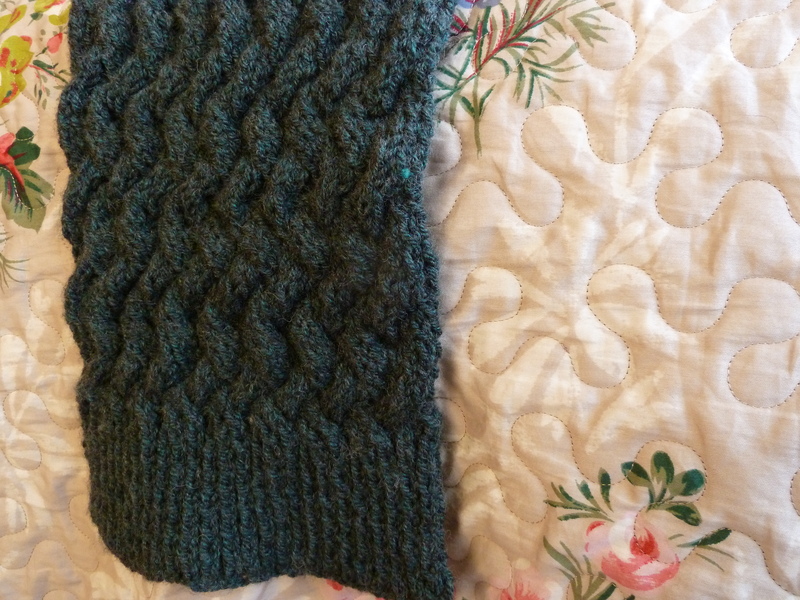 the side of the scarf with the pattern visible. Repeat the criss-cross cable pattern until you have reached your desired length, then finish with K1, P1 Rib for 18 rows. Bind off and weave in any loose ends. Hi, I was just wondering how much yarn you used to make the scarf. I’ve recently got some beautiful blue yarn and I think it’ll look lovely with this pattern! Thanks! Hi Victoria, thanks for the question. Unfortunately, I have no clue how much yarn it took- sorry! Hope you have some luck with it. This pattern doesn’t work. Every other row says k58 when there’s only 52 stitches, and as there’s only 7 rows to the pattern it seems to go to moss stich after the first 7 rows. It’s took me two weeks to perfect too lol. Hi! Thanks for the comment. You’re absolutely right, the k58 is a typo! Sorry! There are only 7 rows which are done on repeat until the desired length is reached. Hope it wasn’t too traumatic of a knit! Knitting’s not my favourite thing in the world! This pattern is a bit confusing. If it’s a 7 row repeat patter with row 7 being a c6b, then row 8 would be an immediate c6f. That can’t be, can it. It’s near to impossible to turn around and do that, especially on what should be a purl row. If I may: I believe the pattern should read as a 12 row repeat pattern. Row one is the coffee row, then 2-6 are knit and purl rows, then row 7 is a c6b row and 8-12 is knot and purl again. Hi, thanks for the comment. I’m so sorry you had trouble with the pattern. Knitting is not my forte and this was my first (and last) knitting pattern. It seemed to work when I used it! Just a small time crafter, junior doctor and quarter-finalist on The Great British Sewing Bee 2016.